After hiking with my friend Kevin last Saturday to visit a couple of Barrier Canyon Style pictograph sites. We managed to find two of the sites we were looking for, but did not find the Ekker Site before Kevin had to go. Once he left to meet some other friends I hiked back up into the canyon in search of the Ekker Site. On my search, I managed to find another small site that I wasn’t aware of which was pretty cool. After photographing that small site I started hiking back to my Jeep, but taking a different way back. That turned out to be a good decision since I ended up hiking right by the Ekker Panel on the way. 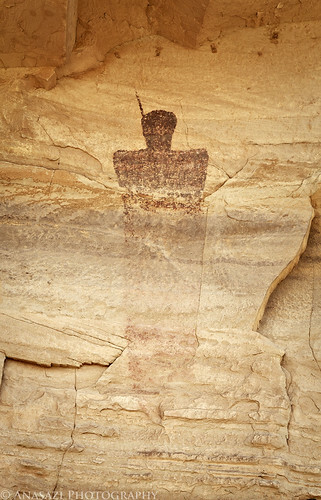 The imposing anthropomorph in the photo above was the largest figure at the site. I’m not sure how tall it was, but I know it was taller than I am! My best guess would probably say it’s about 8 feet? There were many other pictographs and petroglyphs at this impressive site, and I’m sure I’ll post more from here in the future. After leaving the site I realized that Kevin and I had hiked to within about a tenth of a mile from here before turning back. If we had hiked just a little further, we probably would have found it. Had I known where to look when we turned around, I probably could have even spotted this large figure from there! On my way back to the Jeep I got rattled at by a rattlesnake; the first one I have ever encountered in the San Rafael Swell.